For a dinner at home, we recently had the pleasure of entertaining Valter Fissore, the winemaker at Elvio Cogno, and his public relations rep, our good friend Marta Sobrino from the Wellcom agency in Alba. At Marta’s request – this was only her second time in NY and the States – Diane prepared una cena vera Americana, a real American meal. We kept it as local and seasonal as possible (you can read the whole account of it on Diane’s blog) and I sought out good American wines to match the foods – but not too many, because I expected (rightly) that Valter would have some of his own beautiful bottles for us to taste. We began over hors d’oeuvre with Gruet New Mexico sparkling wine. The Gruet family are the real thing, champagne makers from France, and they have very successfully transplanted their expertise. They can’t, by law, call any of their wines Champagne, but they make all of them by the traditional Champagne method, and the results are as authentic-tasting as any sparkling wine from anywhere. We drank their Blanc des Noirs, which I like because of its fine body and excellent, bone-dry fruit. Not to mention its versatility: it partnered very well with very diverse tidbits. Not entirely by the way, it is also very reasonably priced, which makes it very well worth seeking out. The next wine, served with the fish course, was Castello di Borghese Chardonnay 2009. 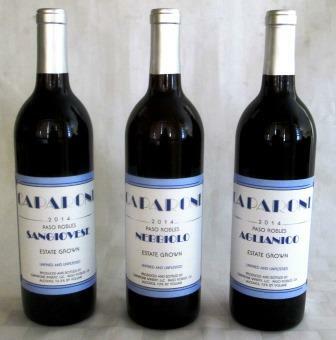 This wine originates on the North Fork of Long Island: The vineyards are those of the original Hargrave estate, the first of Long Island’s serious wine producers. This Chardonnay had never been in wood; that was one of my requirements, and you cannot imagine how difficult it is in New York City to find an unoaked domestic Chardonnay. I didn’t have time run out to the North Fork and visit the wineries to look for one – though given the time it took me to find one in town, perhaps I should have. In any case, I came up with this Borghese wine, American-made and Italian-named, and hoped this was a portent that it would be the perfect wine for my occasion. Well, not really, though it certainly was interesting. It struck everybody with its huge, forward fruit, all of it tropical: pineapple and lichee flooding out of the glass in the nose and on the palate. No evident wood, and decent acidity – Long Island does that – made it more companionable with the fish than I at first feared it would be. Valter seemed fascinated by it, though I wasn’t sure whether that was from pleasure at something so different from the white wine he normally gets or from the strangeness of it. It’s not really my kind of Chardonnay – I like more restraint and more structure – but I can readily see that many people would find it very attractive. And it was certainly genuinely American. When we moved on to meat, we switched to red. I tried a Ridge Zinfandel I’d never come across before – Buchignani Ranch 2007. Normally I’m very fond of Ridge Zinfandels. I like to drink them when they’re ten years old or so, by which point all the California and Primitivo-kin exuberance of the wine has calmed down and come into balance. They usually remind me, at that stage, of classic clarets – very harmonious and deep, even serene. Well, this one wasn’t serene. It was all forward fruit and tannins, a big push in the face of not-yet-integrated flavors. Like the Chardonnay, it wasn’t exactly what I’d been looking for, but it was unquestionably American – and I think a bit of a shock to Italian palates. Which were quickly soothed – as was my own – by the wines Valter had brought. From meat through cheeses (yes, they were American too, and excellent), we drank Cogno Barolo Ravera 2008 and Marcarini Barolo Brunate 1986. 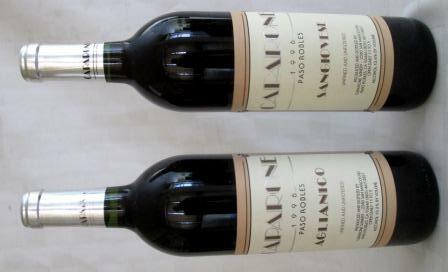 These were two lovely, very different wines. 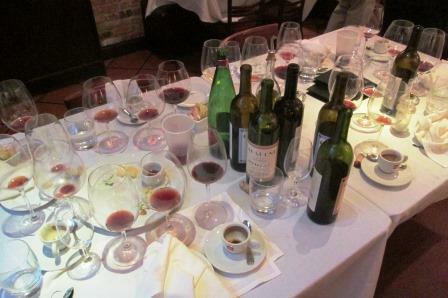 The ’08 Ravera, as Valter pointed out and everyone’s tasting confirmed, showed the affinity of Nebbiolo and Pinot Noir. It had definite Pinot Noir flavors and some of the middle-weight suppleness of that variety. It was surprisingly easy to drink for a young Barolo, with clean outlines and beautifully soft, welcoming tannins. For all its readiness to drink, however, it still shows every sign of ageability: it will be a keeper, I think. This is a great wine for anyone coming to Barolo for the first time, particularly for someone making the transition from French to Italian wines. About the ’86 Brunate, it’s hard to say anything beyond Wow! This was an absolutely classic mature Barolo, elegant, long, totally composed. It had dark, mushroomy/earthy aromas, dark flavors – leather/tobacco/dry black fruits – on the palate, all offering themselves willingly but not brashly: accessible yet restrained, full-flavored yet light on the palate – a short course in what Barolo is all about. This was a wine made by Valter’s father-in-law Elvio Cogno, when he was winemaker at Marcarini before he left to produce his own wines, and it was both an honor and a pleasure to drink it. After all that intense palatal play, the evening ended diminuendo – coffee, grappa, and good night. Which it was. It has to be at least 40 years since I first visited then-young Ridge Vineyards. 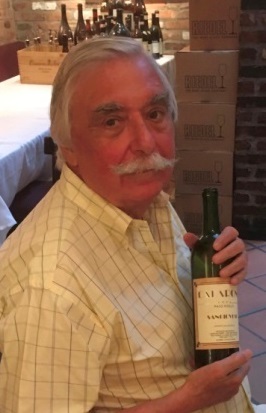 The now-nearly-legendary Paul Draper had only just come into residence as Ridge’s winemaker when Diane and I drove up those curving mountain roads south of San Francisco to what turned out to be, in all senses, an aptly named winery. I remember hardly seeing another car on the road, and the eerie experience, as we rounded one tight curve, of momentarily coming eye to eye with a Red-tailed Hawk, about 20 feet away and hovering with scarcely moving pinions over several hundred feet of empty air. Montebello Ridge was high, and wild, and natural: true pioneer country, and Ridge was – and is – a pioneer. California wine was just beginning to burgeon back then, and while entrepreneurial skills and business daring were abundant, pioneer spirit was as scarce as it always is. The cash was crowding into Napa, some was trickling into Sonoma, and not a lot of people were looking anywhere else. There had been vineyards up on Montebello for years before a few Stanford professors bought up some of them to make a little wine for themselves and discovered that it was better than drinkable. Happily, they weren’t very practical people, and weren’t looking to make a fortune (nobody did, in wine, in those days) or start a franchise, so they just found the best winemaker they could afford and slowly began expanding. Academics used to be like that. In any event, they got lucky again and found Paul Draper – not an academically trained winemaker, and all the better for it. Winemakers used to be like that too. Draper and Ridge worked well together, and the rest, as the cliché in this case accurately has it, is history. Actually, I will modify that last assertion to some extent. For their prices, the best wines made in California are Ridge’s Zinfandels, all of them, even the ones they no longer label Zinfandel because the percentage of that grape in the blend has fallen below the legal requirement. Ridge makes eight of them that I know of: East Bench, Geyserville, Lytton Springs, Pagani Ranch, Paso Robles, Ponzo, Three Valleys, and York Creek. All except Three Valleys are single-vineyard wines. East Bench and Paso Robles are 100% Zinfandel, while the others are all field mixes, varying from as much as 98% Zin down to 72%. Three Valleys and Geyserville can no longer be called Zinfandel because they contain less than 75% of that grape. But they are by no means the least estimable of Ridge’s set. The three valleys in question are Alexander, Dry Creek, and Russian River, all in Sonoma, and all excellent sources of the kind of mature vineyards and old-California field mixes that Ridge likes to work with. In addition to Zinfandel, Three Valleys includes Syrah and Petite Syrah, Grenache, Carignane, and Mataro. 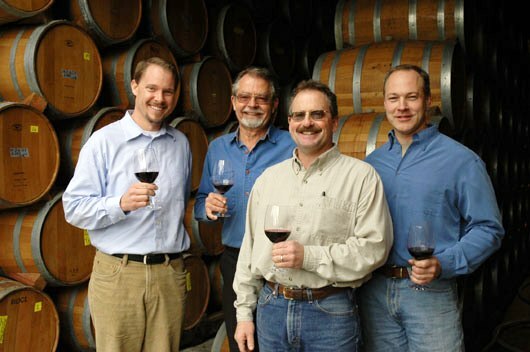 Geyserville’s single-vineyard includes Petit Syrah, Carignane, and Mataro – plus, of course, its old-vine Zinfandel. 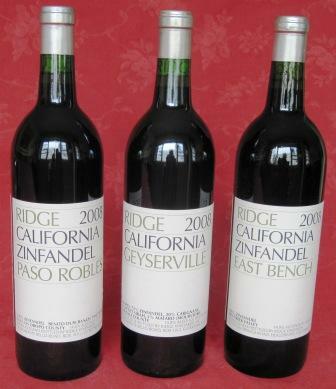 I notice that on the generously informative label notes that Ridge always provides, the 100% Zins are estimated to improve over 7 or 8 years, while Geyserville is credited with a growing span of 10 to 15 years. ‘Nuff said? 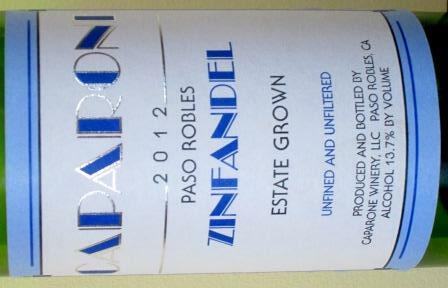 What differentiates all of Ridge’s Zinfandels for me from the vast mass of other California Zins is simply elegance. 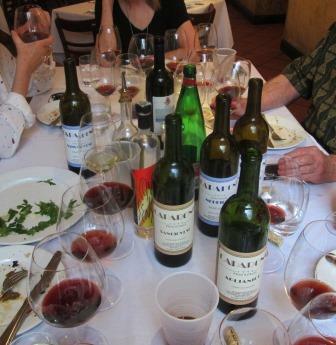 If I can overstate to make my point – and regular readers of this blog must by now be used to hearing me overstate – it is as if the model for most California Zinfandel is inexpensive Port, and the model for Ridge Zinfandel is classic Claret. However lovely and fresh the fruit may be in any of Ridge’s Zinfandels, however high the alcohol (usually over 14 degrees), the overall impression the wine makes is poise – great balance, great harmony, everything coming together almost symphonically. And for me, this just gets better as the wines get older. 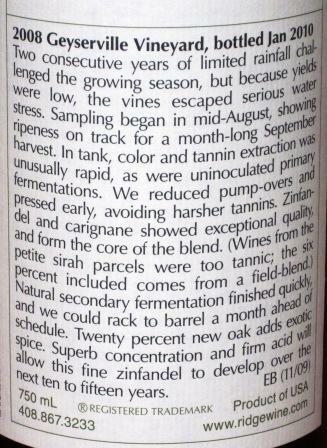 I’d rather drink Ridge’s Zinfandels at about 8 or 10 years from harvest than at release. As a matter of fact, that’s exactly what I’m going to do. I’ve just talked myself into a bottle of Ridge for tonight’s dinner. Cheers!